This is truly my kind of cookbook! There are lots of great recipes in here. They are quick and easy to make and they taste yummy. The ingredients are all foods I've heard of and can easily be found in your grocery store. I love the setup, too. There are 52 menu ideas: an entree, side dish and dessert. These can, of course, be used in multiple combinations so the ideas are limitless. There are also pictures of every dish so you can see what the food looks like. The sisters share a little about each recipe and why they like it. One little tidbit I found interesting (you can find it on their Sloppy Joe page) is they mentioned that they have been approached by two companies to do a reality show. I actually had wondered about that. They've turned them both down and I completely understand their reasoning. There are a few crafts and traditions included as well. My daughter loved the DIY at-home family restaurant and the "crazy dinner" tradition. I like the 52 weeks of food storage and 52 family dinner conversation starters. Yes, I have actually made some of the recipes and my family has loved them! We've tried Slow Cooker Sweet and Sour Meatballs, Perfect Pineapple Dip, Fudgy Brownies, Cheeseburger Casserole, Slow Cooker Sloppy Joes, Mini Garlic Monkey Bread and Cheesecake Chess Squares. This is already my go to cookbook and I will make many more of these recipes. There is a Table of Contents in the front and an Index in the back so as I flipped through and later tried to find a certain recipe again, it was easy to do! This is a great recipe book for busy moms and anyone that doesn't like their cooking to be a long and involved process. I have been making the sisters' recipes for years. I have their previous cookbook and have made a lot of the recipes, so I was really excited to try this one. It did not disappoint. I love the menu format because it pairs recipes together with complementary sides or desserts. I love that I have all the ingredients in my pantry, and I love that they are family friendly. I tried the slow cooker sticky chicken and it was so yummy! I have also made the honey lime enchiladas and they are delicious. My family loves both those recipes, and I can't wait to try more of them. I also love the extras they have like the essential pantry ingredients, the diy chalkboard menu board, and the idea for the "crazy dinner." You may see my full review on my book blog: www.the-readathon.blogspot.com. A beautifully designed book full of delicious sounding recipes that also includes suggestions for making dinner time fun for the whole family. I don't normally read cookbooks, but I couldn't resist this one when I discovered that it lists 52 complete menus. All of the recipes are straight-forward and sound absolutely scrumptious. Truly a book for the whole family to share and enjoy. I LOVE This Cookbook! Every Family Must Have This!! Can I tell you how much I love this cookbook? OK, I’m telling you now…I LOVE this cookbook!! There are so many things to love about this book and there are so many reasons to buy a copy for yourself. -There are 52 menu plans included in this book. The beauty of this is that you can mix and match them and then have even more than 52 menu plans by the time you are done. -The layout of this cookbook is user friendly. My sister-in-law Lynne and I were looking through the book and we both said the layout is easy to see what ingredients are needed. Some times you have to search, but not here, it is in bold crisp print. -Recipes That Are Uncomplicated: The recipes included in the cookbook are easy to make. With women so busy these days we don’t have time to throw together complicated dinners. We need fast and easy dinners to put together for our busy families. These things were a happy bonus along with all of the fabulous recipes. Here are some of the exciting things you will find in the cookbook. The Six Sisters’ Pantry Staples=They list all of the ingredients that you will need to make the recipes found in this book. DIY Menu Board: They show you an easy way to make a menu board to use in your home. Very cute!! The “Crazy Dinner” Tradition” = This is such a fun idea. Every family member gets $5.00 to spend in the grocery story. each member can buy whatever they want for dinner. Then everyone heads home, fixes what they purchased, and then set a candlelit table and eats the meal together. I can’t wait to try this with my family. Well if I haven’t convinced you yet that you need this cookbook, besides inviting you over for dinner some time, then you must not enjoy eating good food. As I said at the beginning of my review, I LOVE this book and I will be using it often! 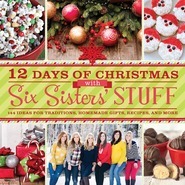 One of the things I most LOVE about the Six Sisters' Stuff is the EASY, FAMILY FRIENDLY recipes! They use BASIC ingredients to bring together delicious meals and tasty treats! 52 weeks of "food storage"
*What was the best part of your day? *What is your biggest fear? *If you could have one dream come true, what would it be? *If you could have dinner with anyone (past or present), who would it be and why? *What is one thing you couldn't live without? Don't miss out on this GREAT COOKBOOK! This is the best cookbook I've reviewed and my new favorite cookbook! Not only does it have a wonderful and durable cover, the pictures throughout the book are mouthwatering. And, EVERY recipe has a picture! This is a huge bonus to me and my family, and not something you see very often. It really adds a lot to the book. Not only is the presentation of this book fabulous, but the recipes are so good! We have tried quite a few of them, and look forward to testing many more (like the Tres Leches Cake-the ingredients are waiting for me right now). When you get this book (because you really should), definitely try the Honey-Lime Chicken Enchiladas. So, so good. I love the variety that is included in the book, and I didn't find any of the recipes too challenging. 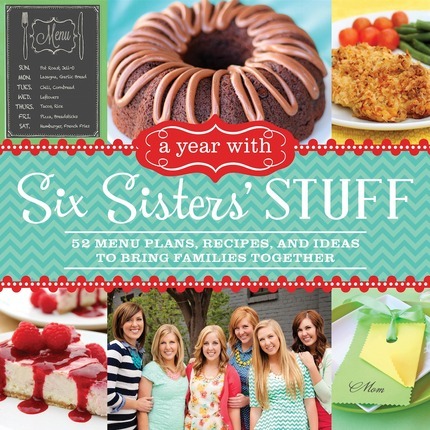 If you or someone you know is looking for some great new recipes, definitely try A Year With Six Sisters' Stuff.